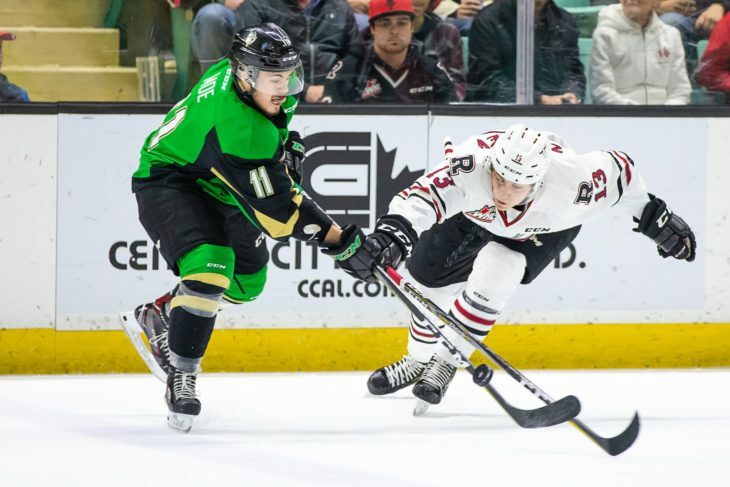 The Red Deer Rebels never gave themselves much of a chance to get back in their WHL Eastern Conference quarter-final versus the Prince Albert Raiders Tuesday at the Centrium. Netminder Ethan Anders did everything in his power to keep the game close, turning aside 38 shots, but the Rebels managed just 16 of their own in a 4-2 loss witnessed by 3,911 fans. The Raiders grabbed a 3-0 chokehold in the best-of-seven series with Game 4 set for Wednesday at the Centrium. “We spent a lot of time chasing. We never had much of a forecheck at all. They’re a good team but you have to get after them,” said Rebels GM/head coach Brent Sutter. “I didn’t like our forwards at all tonight, there was no urgency at all getting in there to battle and compete. Then when you have turnovers in the neutral zone, in our zone . . . we chased a lot of numbers tonight. The visitors needed just 69 seconds to get on the board, as Rebels defenceman Jacob Herauf had his pass land on the stick of Noah Gregor at centre ice. The Raiders forward darted across the blueline, made a nifty move on defender Ethan Sakowich and beat Anders with a backhand. The Rebels hardly pushed back and they finished with just five shots in the period while giving up another goal as Dante Hannoun, with the Raiders killing a penalty, went end-to-end and ripped a shot off the post and in. Rebels captain Reese Johnson said the early goal seemed to set his team back. Red Deer finally broke through on a fine individual effort by Brandon Hagel early in the second period. The Rebels star winger circled in the high slot, cut down low to the net and buried his own rebound. Thanks to Anders, the game was still on the line late in the third period, but Gregor took advantage of a turnover in the Red Deer zone and made it 3-1 with 3:15 remaining, his wrist shot from the right circle catching the top far corner of the net. With Anders on the bench, Johnson gave the Rebels one last breath of hope when he cashed a rebound from the edge of the crease with 62 seconds left, but Parker Kelly scored an empty-netter at 19:41 when the puck bounced over the stick of Dawson Barteaux at the Raiders blueline. “I didn’t think it was our best game at all. We came out flat and in Game 3 of playoffs that’s unacceptable,” said Johnson. “We can’t dwell on this loss because we need a win tomorrow. It’s do or die and we just have to make sure everyone is going and we have to lead it ourselves. 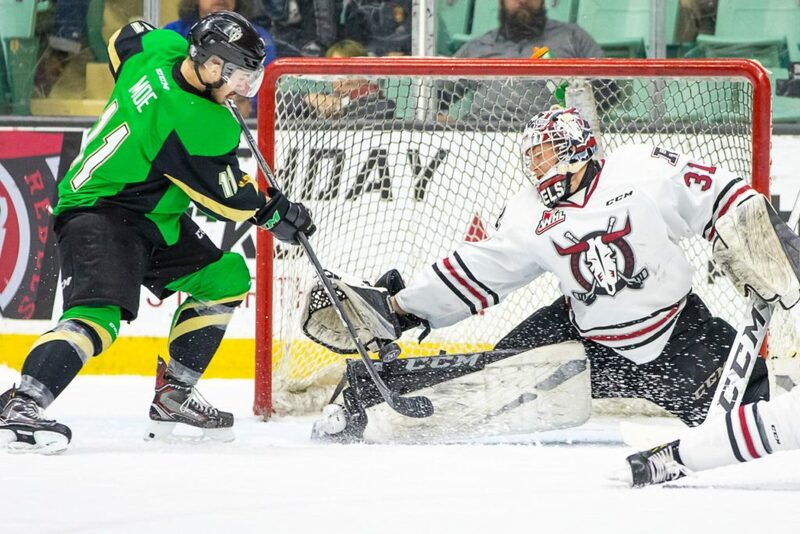 For the Rebels to stay alive in the series they will absolutely have to create more in the offensive zone and direct more shots at Raiders netminder Ian Scott. “No. 1, everything is too slow, we get it we have to get going. There have to be decisions made before you get the puck,” said Sutter of his club’s inability to get rubber through to the net. “You get it and you have one 1,000, two 1,000, three 1,000 counts and you’re not going to get shots. It’s stuff you work on all year in practice, but we seem to have guys who seem to have a hard time grasping the details and fundamentals of how you have to play. The Raiders were seldom pressured in their own zone and used their speed and transition game to quickly move the puck up ice. “Our defence was on their heels because everything was coming at them. It’s hard to play defence like that,” said Sutter. “We weren’t winning any puck battles along the boards, their defence was coming down and we were turning pucks over. And so, as Johnson noted, Game 4 is do-or-die for the Rebels, who Sutter insisted shouldn’t need any motivation from the coaching staff. “I don’t think there has to be lots said. I didn’t think there had to be a lot to be said today,” he stated. “You’re down 2-0 in the series coming into your home rink. “We tweaked some things within our system to help the kids out, but if there no urgency it’s kind of fruitless in a way. “It’s unfortunate but we have to get ready for tomorrow. Obviously our backs are against the wall and we have to get a better effort from a lot of players. That to me is not the way you can play at this time of the year. Notable: Selected as the game’s three stars were (1) Gregor, (2) Anders, who made a pair of big-time stops on Gregor and also took goals away from Spencer Moe and Alexei Protas, and (3) Hannoun . . . 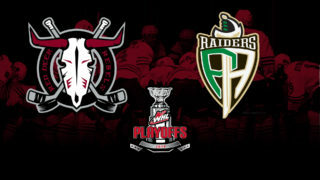 If the Rebels prevail Wednesday, the clubs will head back to Prince Albert for Game 5 Friday. Sixth and seventh games, if needed, will go Sunday at the Centrium and Tuesday in P.A.